Counting head lengths when drawing fashion figures works when dividing up the length of the legs. The entire length of legs in a figure drawing runs about 4 heads. 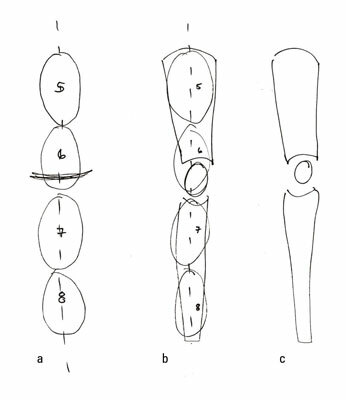 The knee joints start within the 6th head. Men’s legs are thicker than women’s. Keep a woman’s leg long and curvy while making a man’s wide and straight with muscular calves. Mark off 4 heads (ovals) to show the length of the leg. The knee falls in approximately the bottom 1/5 of the second oval from the top. Draw in two cylinder-like shapes over the 4-head length, making the top cylinder slightly shorter than the bottom cylinder. Connect the two cylinders with a circle for the knee. The knee circle should be about 1/2 head tall. End the bottom part of the leg at the bottom of the 8th head. Erase the head markings from Step 1, leaving the cyclinders and circle to create the leg shape.